Unfortunately, this is not a “real” picture of the White Lady, but rather a ghost superimposed over a photo of the Liberty Mine entrance in Latuda, courtesy of Bonneville Mariner. 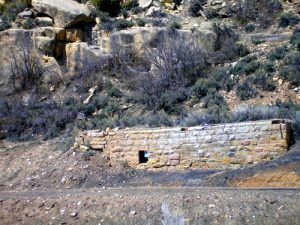 Due west of Helper, in Carbon County, Utah is Spring Canyon, a one-time coal-mining mecca now filled with ghost towns. Here, along this rugged path, surrounded by mountains, boulders, mining remnants, and the crumbling remains of once thriving buildings, roams an ethereal white lady. Before the mysterious “white lady” and the many coal miners who lived in this canyon, the area was long occupied by the Fremont Indians, who left behind numerous rock art panels. Other larger occupants, namely dinosaurs, also left their marks in abundant large footprints which have been found in many of the area coal mines. 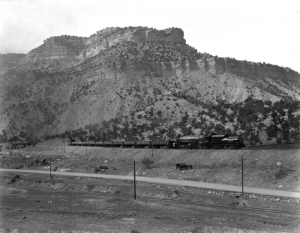 Carbon County changed dramatically; however, when the Denver & Rio Grande Western Railroad began to seek a route from Denver to Salt Lake City in the 1880s. Utah Railroad in Spring Canyon, Utah by Harry Shipler, 1927. As the railroad opened up the area, coal was discovered and by the late 19th century, the county was filled with coal mining camps. As prospectors continued to search the region for coal, more was discovered in Spring Canyon and the first mine in the district was established in 1895 at Storrs. Over the next several decades, numerous mines and small settlements sprouted up in the canyon, including Standardville, Rains, Peerless, Mutual, and Latuda. Throughout the decades the Spring Canyon District was called home to over 2,000 miners, businessmen, and their families as the mines extracted almost 43 million tons of coal from the rugged hills through the 1960s. Though the mines brought people and prosperity to the region, it also brought tragedy and violence in mining explosions and major strikes. But, when Spring Canyon’s heydays were over, it left behind only memories, scattered mining remnants, fading ghost towns, and legends, the most famous of which is that of the White Lady. Persisting for years, the legend has numerous variations that have been told of who this mysterious woman might have been. Though her identity may always be in question, it is interesting to note that a century ago, women and mining equaled bad luck to virtually every miner in any type of mining camp. 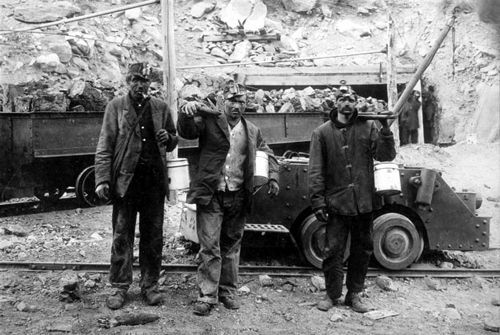 The superstition, having its roots in Europe, was very strong among immigrants, which tended to make up the vast majority of miners of the time. These miners believed that disaster and tragedy would follow if a woman visited a mine and could cite instance after instance of “true” stories that had occurred. Though outsiders believed these instances were purely coincidental, the miners didn’t think so and became extremely agitated if a female even got near a mine shaft, causing almost as much nervousness in the mine workers as did ghosts or Tommyknockers. Given the superstitious nature of the coal miners, it is not surprising that the legend of the “White Lady” has been told for so many years. The woman was believed to have lived in Latuda, which is about seven miles west of Helper on Spring Canyon Road. 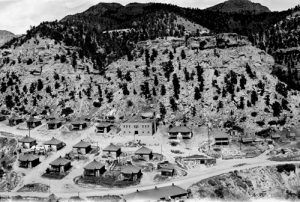 The mining camp, which got its start in 1917 when the Liberty Mine went into production, once boasted numerous homes, a post office, a school, a company store, mining offices, and about 400 people. One version of her history says that her husband was killed in the mine and his body was never found. Another says that both her husband and a son were killed in a mine accident, leaving her alone with an infant daughter. The tale continues that her baby was later kidnapped, thrown into a wash and drowned. Afterward, the woman lost her mind and soon died. Yet another version alleges that she lived in Peerless, another mining camp situated just about three miles west of Helper that thrived from 1917 to 1930. This account says that after her husband died from blood poisoning and, as his death was not mining related, she and her infant child received no compensation and were destitute. Instead of allowing her baby to starve, she drowned it, lost her mind and was institutionalized in a mental facility. Later she escaped returning to Peerless, where she later died. Another report says that she herself was killed in a rockslide in Latuda, while an additional story says that her child was killed in an avalanche and she later committed suicide. A final tale says that after her husband was killed in a mine accident that the company refused to give her full compensation and after a confrontation with mine officials, she was so angry and driving so fast, that she drove off the narrow road and was killed. Though the truth of her life will probably never be known, for whatever reason, she continues to make her presence known in the canyon. Some say she seeks revenge against the mining company or against those who kidnapped her infant daughter. 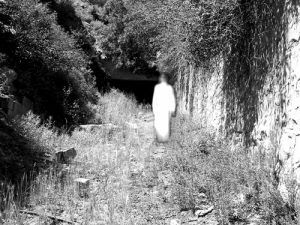 Dressed all in white, others say that she continues to search for her lost child, specifically in the canyon wash. Interestingly, this sounds very much like another popular legend – that of La Llorona, who has been seen haunting rivers and streams, also looking for her lost child, throughout the southwest for centuries. In any case, numerous sightings of the spectral lady in white have been reported throughout the years. Some of the earliest accounts say that she was known to float around the entrance to the mines, luring miners into their vast depths, ensuring certain disaster. Other tales are not so sinister, saying that instead of enticing them into the mines, she would appear to warn them to leave in order to avoid some kind of accident. Allegedly, she has been seen several times around the Latuda mine entrance, inside the mine, and near the old Liberty Mine office. By the 1960s, the legend was so well known that teenagers often came to the Latuda mine office at night to tell ghost stories and catch a glimpse of the spectral lady. On one occasion, though there is no evidence that the ghost ever appeared, the teenagers’ visit resulted in disaster when one of them blew up the building, resulting in his imprisonment. Other reports tell of sightings of her walking around the abandoned town of Latuda, usually in the direction of the mining office, but disappearing just before she reaches it. © Kathy Weiser/Legends of America, updated October 2018.